You know that feeling when you walk into a crystal shop or open up the online catalog of an online store that sells crystals? You know, excitement, wonder, a little overwhelmed. There are so many shapes, sizes and colors. Just think of the possibilities! What do you choose? You’ve probably heard before that you don’t actually choose the crystal—they choose you. Whatever vibrational frequency you are resonating at in the moment, the crystal that can help you will be the one that attracts you. Maybe you need to be more grounded, maybe your creativity is blocked, maybe your self-confidence is a bit low, maybe you are feeling unloved or unworthy, maybe your having a hard time expressing yourself, maybe your intuition is a bit off, maybe your feeling out of balance or disconnected, or maybe it’s something else. No matter what your issues are when you find yourself searching for the perfect crystal, it will find you and you will receive it’s healing energy. As you are probably aware, the Principle of Gender states that everything possesses receptive and projective energies and one is usually expressed more strongly than than the other. This holds true when it comes to gemstones. Black, red, orange and yellow stone hold receptive energy that is magnetic, soothing, and promote love, calm and peace. They can be used for meditation and de-stressing and can promote wisdom, love, sleep, friendship, prosperity, fertility and growth. White, green, blue and purple stones hold projective energy that is energizing, activating, and promote passion, creativity and abundance. They can be used for healing, luck, success, courage and self-confidence. Gemstones that are multi-colored, are multi-purpose. They carry the metaphysical properties associated with the colors that they possess. Wouldn’t it be nice if there was a single page reference sheet with this information that you could print out and store in your grimoire? I’m way ahead of you kid! Click that button below and enter your info to get you printable version. 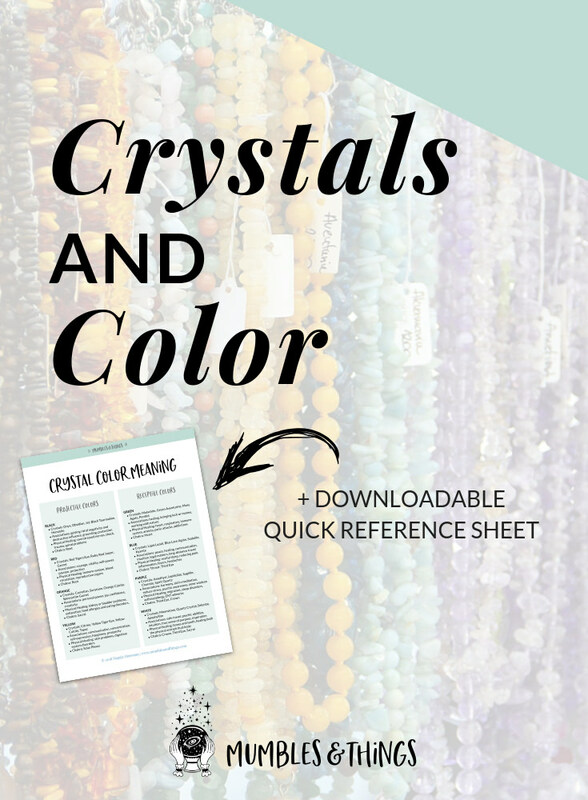 What is your favorite crystal color? Tell me below in the comments.